The first public demonstration of the use of ether during surgery was a seminal moment in medical history. 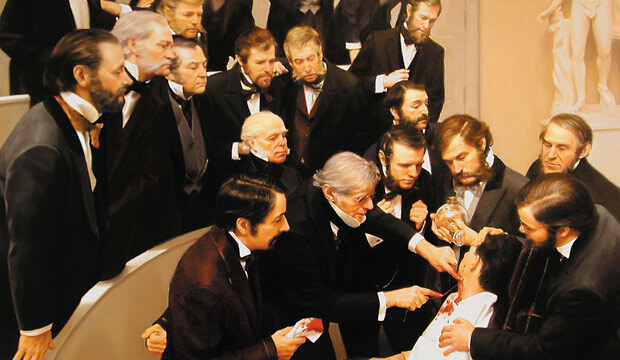 This first public demonstration of ether during surgery (depicted above) so impressed the local community that the Massachusetts General Hospital building where it took place—an amphitheater with a copper-clad cupola—became known as the Ether Dome. 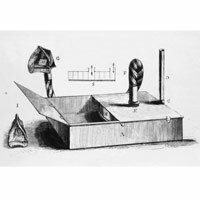 Boott passed along the news to a colleague, dentist James Robinson, and on Dec. 28, 1846, the physician John Snow observed as Robinson used ether while extracting teeth. Snow, who had already tried using ether to treat respiratory disorders, was thus inspired to investigate the effects of temperature on ether vapor, to develop better inhalers for administering the gas (such as the one shown at left), and to write more than 80 articles, letters, speeches and books that helped shape anesthesia into a science. Snow’s awareness of how gases such as ether affect the respiratory system also proved critical during London’s 1848 cholera epidemic. Most believed the disease spread through miasma, or foul air, in places like slaughterhouses. But if this were true, Snow realized, slaughterhouse workers would have been most susceptible, and they weren’t. The insight spurred him to collect data showing that cholera was spread by contaminated water. In 1853 Snow’s name was so synonymous with anesthesia that he provided it at a royal labor. For Queen Victoria, Prince Leopold’s birth was “soothing”; among physicians, the event sparked debate over the drug’s safety. By the time Snow repeated the feat at the birth of Princess Beatrice, in 1857, labor anesthesia had become more accepted—thanks partly to its very public sanction.